I got the story because of the mention of werewolves in the description. The werewolves in the story were not what I was expecting, but I kept listening because I was hooked by Kate, the heroine. She's smart, street tough, and funny. I loved the twists and turns the story takes, it kept me me on my toes. Now that I've finished the story, I have to get Part 2 to see where the story goes. The characters are well developed. The setting was described so well you could practically smell the stinch in the Arteries. Morgan Hallet does a great job at making all the characters voices destinct and real. Fans of The Mercy Thompson series will also like this series, just realize that you won't be reading about a "typical werewolf pack" story. I hope there are many more stories of Prospero's War to come. I had a hard time reading the book the first time around. Someone had suggested listening to it instead and that the Lord John's humor comes across more clearly. I have to agree. I thoroughly enjoyed Jeff Woodman's ability to do the various character's voices. 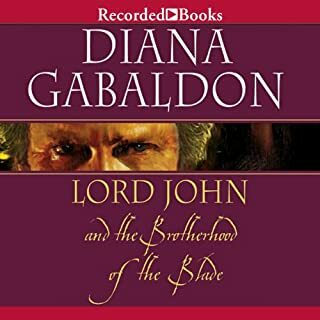 It was a treat to re-read the story in audio. I enjoyed the way the story tied two historical characters together who seemingly wouldn't have much in common. Both share a closeness to the thrown (although only one of these women would have had a claim to the thrown) and their lives were tightly controlled because of this tie. Katherine Grey saw her sister killed because her her royal blood, Katherine, too, feels threatened...it is indeed a dangerous inheritance. Both Katherines also share a common need to know what exactly happened to the missing Princess in the Tower. Because the story jumps back and forth between the two Katherines, I often had to pause and remind myself which one was talking and what I knew about her, before I could continue listening. This going back and forth really hindered my being able to enjoy the story as much...maybe if the voices had been more distinct or something. 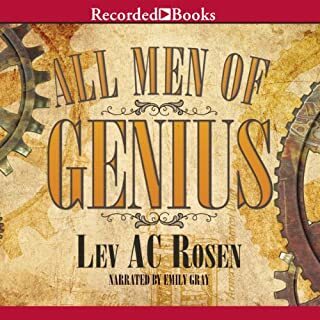 Set in a steampunk version of Victorian England, Lev AC Rosen’s acclaimed debut novel, All Men of Genius, follows the fantastical adventures of Violet Adams. Determined to attend the prestigious Illyria College, Violet gains entrance by masquerading as her twin brother Ashton. But continuing the scheme turns out to be difficult - especially when “Ashton” is faced with blackmail, killer automata, and possible romance with a young duke. Enjoyed story, for the most part. The story weaves several plot lines together which play off each other and makes for a very enjoyable read/listen. I would recommend this to anyone who enjoyed the Parasol Protectorate Series. What about Emily Gray’s performance did you like? I really enjoy Emily Gray's ability to change accents and read for both female and male roles. She has an amazing talent for voices!